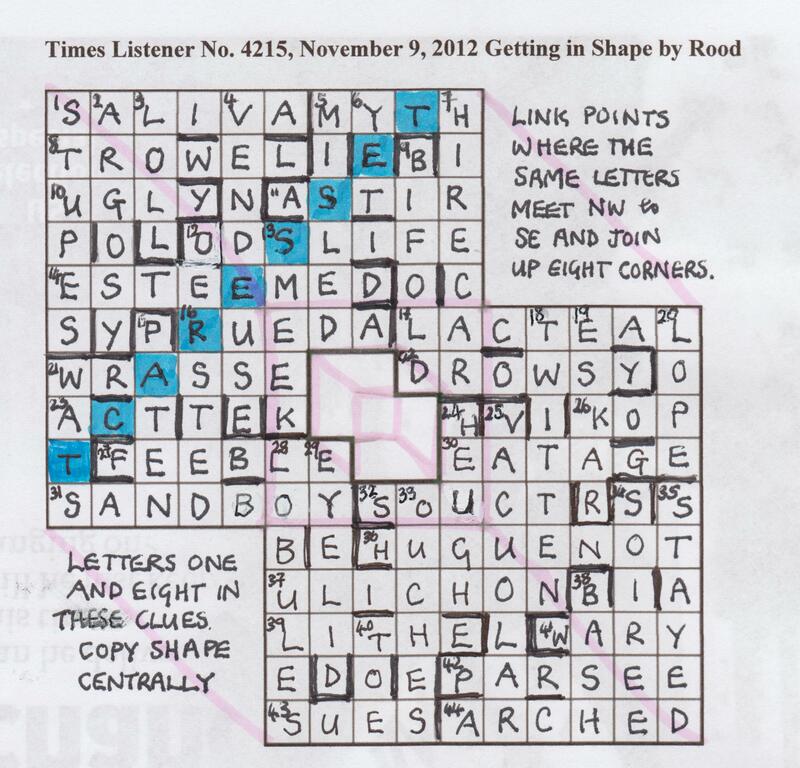 This week, new setter Rood tantalises us with an interesting-looking grid … that caused me much grief when creating its entry in the Crossword Database. In the end, I described it thus: “A 15×15 carte blanche grid, but missing its top right and bottom left 5×5 blocks. There is also a hole of similar shape in the main NW-SE diagonal.” The puzzle already owed me! One of the nice things that we were told was that the bars would form both 180° and mirror symmetry, so that ought to help. What’s more we wouldn’t be required to mark the bars in submitted solutions … they can be so fiddly, not to mention exasperating if got wrong. (Has anyone done that?) Finally. there would be two instructions to follow and, of course, a bit of highlighting. Two types of clue were before us (misprints and missing letter in wordplay). Disentangling them might prove tricky, depending how sneaky the misprints were. Plus, I know that I find wordplay missing a letter much more tricky than misprints with an extra letter. I suppose more is better, as with most things in life. I was encouraged after a few minutes, with 1dn STUPES, 10ac UGLY and 4dn VENDEUSE in the top left, and 42 PARSEE, 43ac SUES and 44ac ARCHED in the bottom right. This immediately enabled more than the usual number of bars to be entered, and I felt the puzzle was well underway. Which it was … but fairly slowly. My fear of sneaky misprints was well founded. Take the simple 11ac Tar having jostled having come to lift (5) which was obviously STAIR with a misprint giving ‘home to lift’ or ‘core to lift’, although neither really worked. Of course, the answer was ASTIR defined by ‘having come to life‘. And then there was 1ac Liberation of sodium from salt lake with last pair of eggs in what was spawn (6). Well, there couldn’t be a misprint in there, surely. But there was – spawl is an old word for saliva, with SALINA – NA + [O]VA.
One final point needed clarification. 14ac Editor framing earl after second flush is let down (8). This was obviously ESTEEMED, with ‘s’ replacing ‘l’ to give ‘set down’ as the definition. However, I really couldn’t justify that from the definitions given under esteem; in fact, ‘set up‘ would be more appropriate. Well … if it doesn’t work one way, try the other. Looking up set down gives ‘esteem’ as one of its definitions. 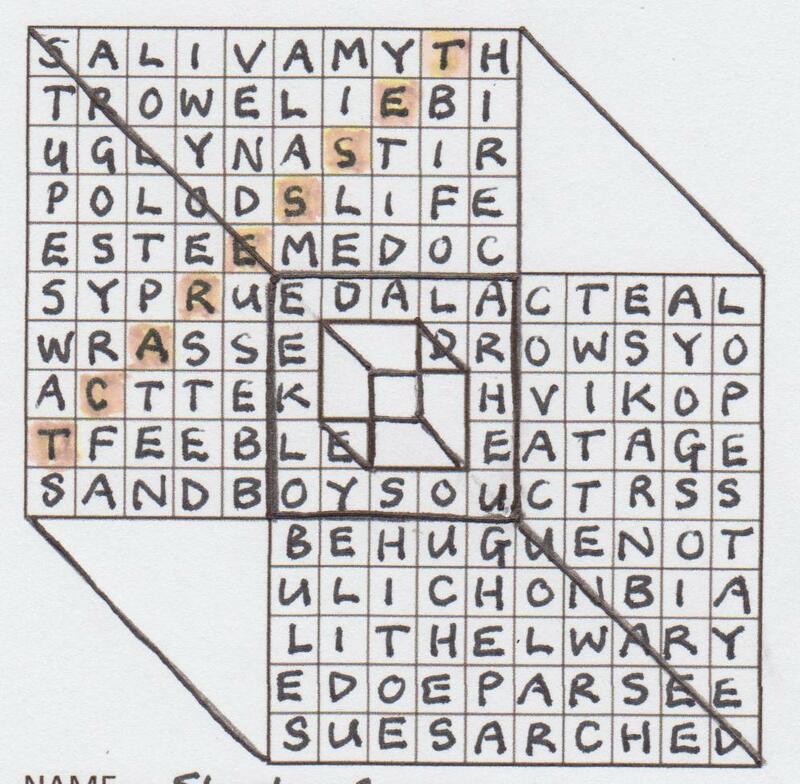 Letters one and eight in these clues. Link points where the same letters meet NW to SE and join up eight corners. I have to confess here that, for about half an hour, what was fairly obvious totally eluded me. 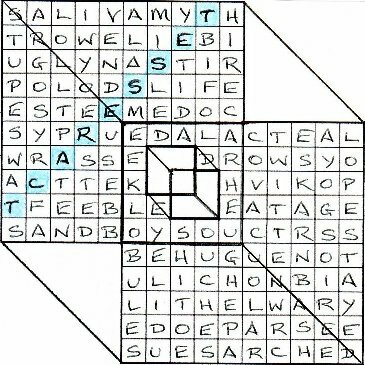 I started by highlighting those squares where a letter would be mapped to the same letter if the grid were folded NW to SE. I don’t remember now what that gave me, but it was rubbish. But making me think in a NW-SE way, I eventually saw the four letter pairs around the central space: C, U, B and E.
Even the next step proved tricky as I tried to join up the opposite NW and SE corners of each of the pairs to make a little cubic shape. But that made the finally instruction about copying the shape centrally a bit odd. Were we just supposed to do a freehand drawing of a cube in the middle? That didn’t seem right, so it probably wasn’t. So back to the linking and joining of points and corners. And looking at the big picture with a tesseract in mind, I realised what needed to be done. Basically, what was needed to be done was to follow the instructions given in message 2. I joined the meeting points of each of the pairs of letters to form a square, and then joined the eight corners of the two ‘overlapping’ squares that formed the grid. 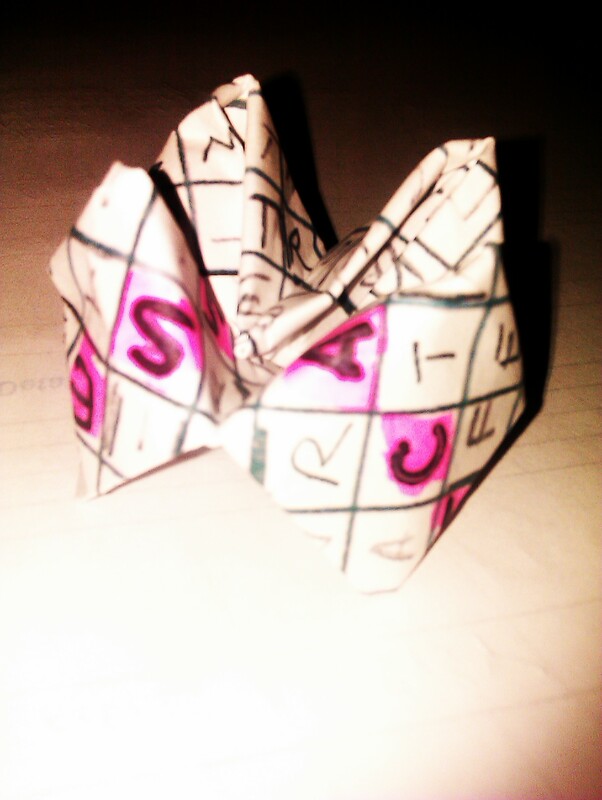 What I ended up with was, of course, a cube. Voilà! So I did have to draw a freehand cube in the centre of the grid? Of course not! The little blank area in the middle was the same shape as the grid for a reason, and I joined its corners together to form a nice little second cube. I was finished, wasn’t I? Well, not completely. A tesseract has, according to Wikipedia (to which thanks for the stunning little animation below) each of the eight corresponding corners of the two cubes linked. But we weren’t told to do this. Surely that was a flaw, and I was tempted to draw the lines in anyway. However, if in doubt, consult the BRB. There, the definition for tesseract is ‘a figure of a cube within a cube’. Whether that’s right or wrong, I didn’t really care … it explained everything. 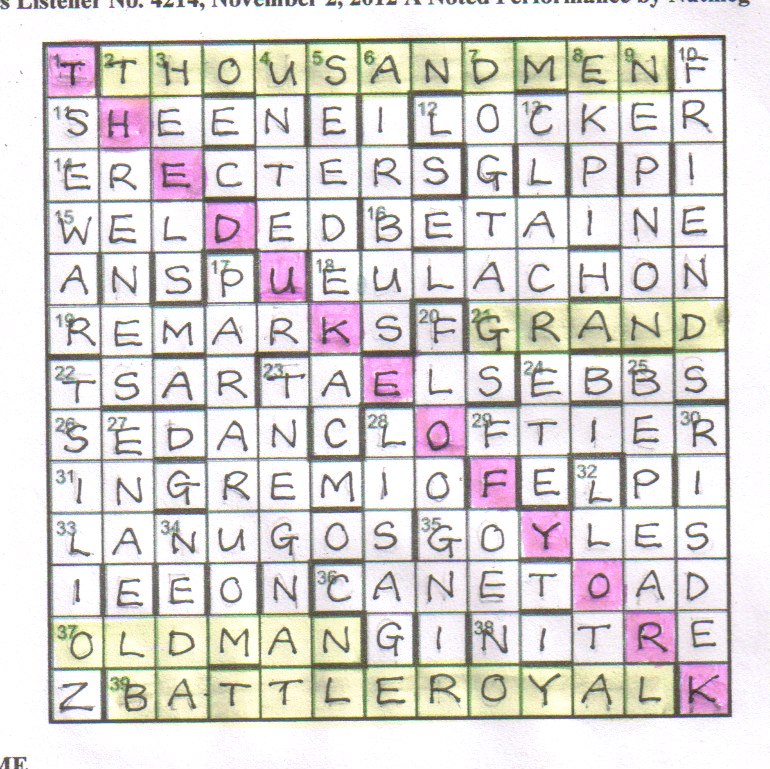 Many thanks, Rood, for an excellent puzzle … good clues and a superb denouement. Oh the noble Duke of York/ He had ten thousand men,/He marched them up to the top of the hill / And he marched them down again. / And when they were up they were up, / And when they were down they were down, / And when they were only half way up, / They were neither up nor down. With a couple more clues in place and having established that Nutmeg is a member of the Listener Compiler imbibing fraternity – there were the tipply clues; ‘Abroad Englishman sampled port (4)’ (ADEN hidden) and ‘More gin drunk by one embosomed by Caesar (8, 2 words)’ (MORE GIN I* = IN GREMIO) we were able to fit THE DUKE OF YORK down the leading diagonal. We had already placed his 10 THOUSAND MEN, the BATTLE ROYAL and the GRAND OLD MAN in the grid. This was fun. We were keeping a record of the solutions that were going up, those that were going down and those that were half up/half down or half down/half up. ‘Approximately equal numbers of each’, said Nutmeg. That was helpful, as we needed no more than six of any one type. We quickly had six normal down clues and 22d couldn’t be a half up half down solution as it had seven letters, so it had to go up, as indeed it did. ‘Carping critic, “cross one” on series (7)’ (ZO + I on LIST = ZOILIST) – Now that’s this week’s new word for me to drop casually into dinner-table conversation. But indeed, I am not a zoilist. We had a wonderful whoop of elation as our grid was filled before dinner and we sent Nutmeg a silent vote of thanks. We are travelling a long way tomorrow to Doc’s splendid crossword event in Budock Vean and this impeccable but not too difficult Friday evening solve was just what we needed. Many thanks, Nutmeg. … and we had A Spirited Performance from Kruger last week. 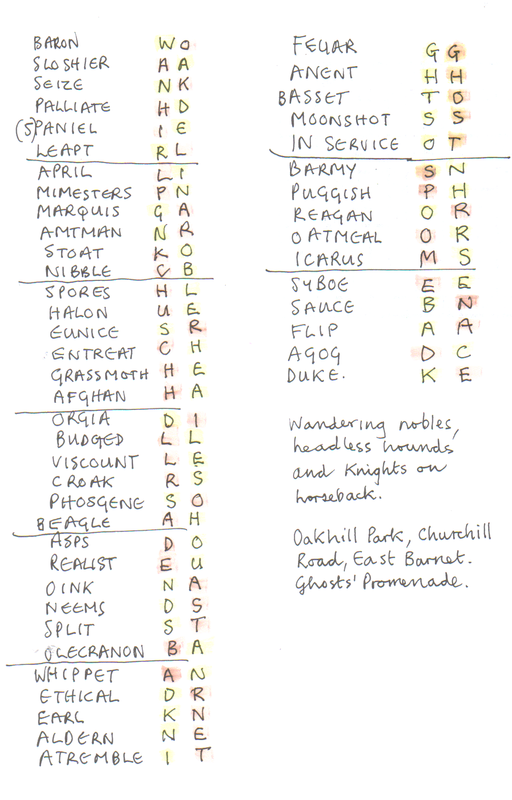 It seems that this is the year of puzzle pairings: there was Ifor’s Flying Scotsman 4472 followed by Ferret’s British Rail logo; KevGar’s Links followed by Artix’s golf course; and not forgetting Kea’s Scattered which used exactly the same set of letters as Hedge-Sparrow’s Here and There three weeks before. I hoped that the editors didn’t have a trick up their sleeves for the mathematical in two weeks time! And so, on to Nutmeg’s latest offering. The across entries were normal, thank goodness, but the downs had to be entered in various, unspecified ways. And five entries (one unclued) seemed to have something to do with a historical character who was to found somewhere in the grid. Not many acrosses were solved to start with unfortunately … a paltry half dozen. Luckily the downs went really well. 1 RAWEST had to cross with 11 SHEEN, 14 ERECTERS and 19 REMARKS. 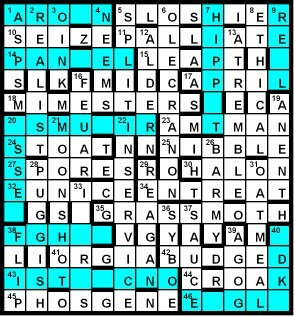 (How fortuitous that half my acrosses were in the top left quadrant.) So RAWEST had to be entered as •SE••R … reversed I’d say. Going back to 15ac which probably began with a W, and I got WELDED. 2dn THRENES (to fit into •HRE•E•) and 3dn HEELS (to fit •EEL•) came next. Perhaps they just had first and last letters swapped, while 4dn UNTRUE (•NTE•R) could possibly have its second half reversed. With 5dn SEEDCAKE going in as SEEDEKAC, the top left was pretty much complete. A quick glance at 2ac, which began TH•US, and it looked like THOUSAND something. 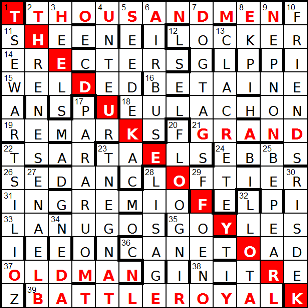 But an even quicker glance at the diagonal revealed everything … there sat THE DUKE and it was almost certainly THE DUKE OF YORK, with his ten THOUSAND MEN lurking in the top row (10 in the preamble was sneakily meant to look like a clue number). And so a very quick PDM this week as the down entries were to be entered in one of three ways: up (reversed), down (normal) and neither up nor down (or, more accurately, half and half). The clues were good, and I counted 6 down entries, 6 up, and 10 half and half! I suppose my two favourites were 18ac Flipping hard clue framing answer assigned to fishy light? (8) for EULACHON, and the &lit 20dn What’s lino good for otherwise? (8) for FLOORING. Thanks to Nutmeg for a fun implementation of a childhood theme, and a nice easy jaunt for me on a Sunday afternoon. All that was left was to fill the rest of the day … now where’s that EV? The numpties need that red herring again as for the first half of the solve, we were convinced that we were dealing with Shakespeare’s Henry VI Part I or three separate Shakespeare plays. Not only did we have what was almost a carte blanche, with clues in alphabetical order of their solutions, but also we were given a deceptive preamble that led us to expect some kind of dramatic performance. Labouring under this delusion, we continued this laborious solve. There was no short cut, was there? There was no way one could guess at the theme and render this cold solve easier. Kruger didn’t even lighten our task with the usual Listener compiler tipple: there was just a ‘watery mess’ (‘Preparation for Andalusian horse is beginning to look more like a watery mess (8)’ (SLOSHIER from HORSE IS + L(ook)*) and ‘… dubious bouts of overindulgence’ (Possibly Cesare, no bachelor, in [dubious] bouts of overindulgence (5)’ BORGIA less B). The difficult thing was that we had to have almost all the solutions in order to begin to fill the grid. However, with some generous gifts like ‘Mesmerist [painlessly] knocked our actors (9)’ (MIMESTERS) and ‘Snakes [defoliated] old trees (4)’ (ASPS) we soon had all but ten of the solutions and with the four nine-letter words in our set, began what looked like an easy fill. No, that’s not numpty talk – there is no such thing as an ‘easy Listener grid fill’. I should know better. When most of our forty solutions were in place, we were faced with, for example, the dilemma that the remaining eight-letter solution had to begin with T, U, V or W, but the remaining eight-letter light read ISTUCNO. That’s not a word, said numpty 2 and stomped off in disgust. It took me a while to see that BARON, DUKE, EARL, MARQUIS and VISCOUNT were anagrammed and thus ‘modified’ before entry and the penny dropped that BASSET, AFGHAN, BEAGLE, SPANIEL and WHIPPET simply needed to lose their heads to fill the remaining lights. 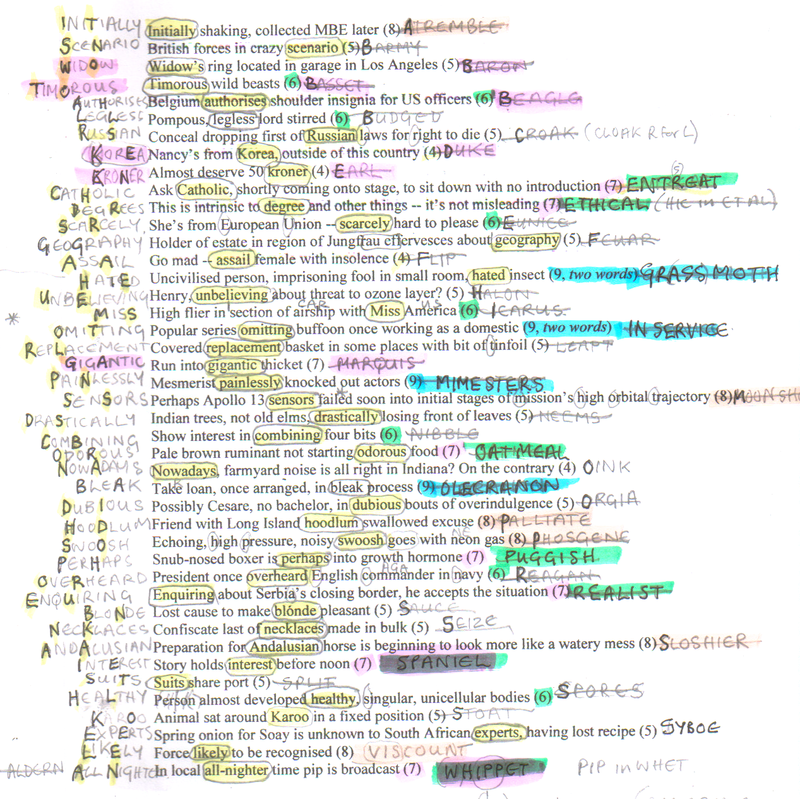 Just in case I made that solving process sound easy, here’s a thumbnail of our solving sheet, all colour-coded to help us spot word-length, characters and so on. And we weren’t finished yet! Kruger had set us a substantial Friday evening workout. 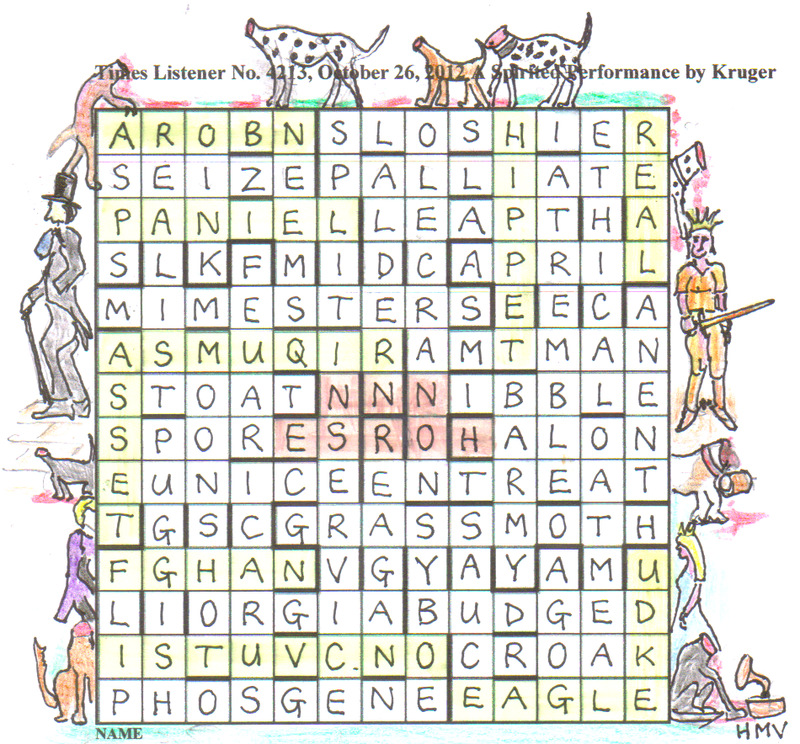 We now had to list the solutions in conventional order with those first and fourth letters we had extracted (of course, giving Kruger a pat on the back as we did so for managing to find all the 100 necessary letters that would provide the venue of the performance and the cast in words that were embedded convincingly into the clues). The headless hounds and wandering nobles now made sense. This was clearly intended to be a rather back-to-front solve wasn’t it when we couldn’t understand the theme until we had applied it by beheading a few dogs and making nobles wander? It reminded me of that classic Asterix where he needed form B to get form A but couldn’t have form A if he didn’t produce form B. What can I say? It was a bitterly cold evening and Kruger kept two of us busy for about five hours, entertained us and introduced us to a topic that was totally new to us. 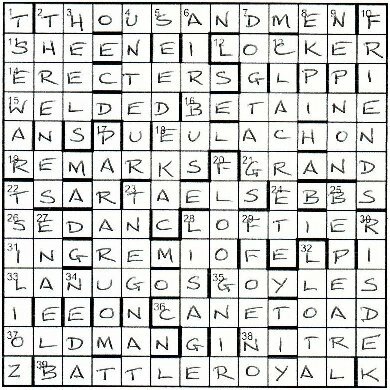 He was unlikely to have anyone preempt his theme or anticipate it and what a tour de force to put all of that information into a 13X13 grid with 100 more thematic letters hidden in the clues. Thank you, Kruger.